A mixing bowl of emotions. Worry about the kids who are walking the razor’s edge, sadness for the relationships built and interrupted by a 9-week sabbatical, relief, because I am emotionally weary. Looking forward to a summer vacation in Block Island, Rhode Island, looking back on a learning curve that happens in May. Retrospect, hindsight, call it what you will. An important and critical step for all teachers to take their own inventory. I got in my car to run to HyVee and get a six-pack, two cartons of onion dip and two bags of chips to take to an end-of-the-year party given by one of the faculty members. Zip into HyVee. Back to my car. I-35 South to 635 North. Thump, thump, car shuddering like the Incredible Hulk is using my car for a rattle. Ease off the gas thinking that may fix it. (I know, I know, I’m a ridiculous optimist) I’m in the middle lane, and I move over to the right hand lane and ease off onto the shoulder. Get out, fit to be tied. 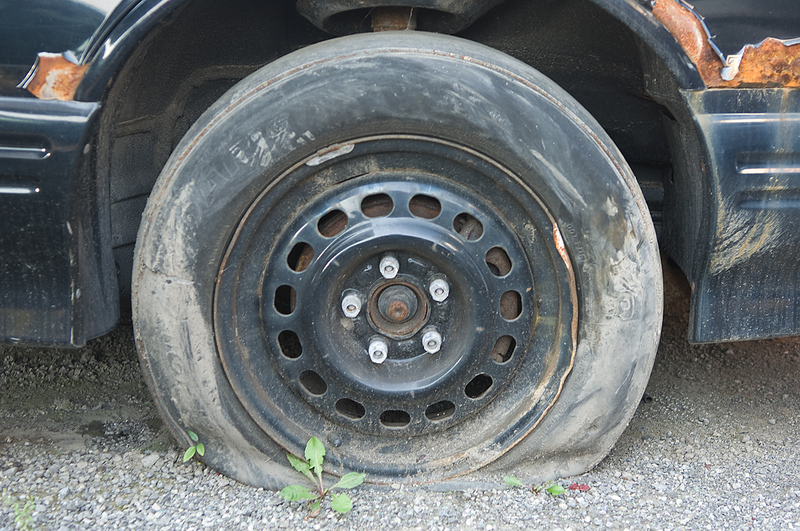 No flat tires on the driver’s side, and upon inspection, find the front passenger tire shredded and halfway off the rim, the smell of burning rubber nauseating. Then the unthinkable. I have no cell phone. As my kids would say, “Your phone is always home on the charger.” Standing on the side of the road, praying for a State Trooper or a KCKS policeman or not-a-thug to stop. Nothing. I am forty minutes into this so I do what any savvy woman would do — start walking toward the nearest exit. Easily a mile away. This little trek through grass halfway up my calves, beer bottles, trash, debris, bugs and a two-week old hip replacement just to complicate things. About three-quarters of the way to the exit I realize that there is nothing at this exit that can be of any help. No gas station, no Quik Trip. Land and the occasional house. Trek back to the car. Now what? And then……could it be? A white SUV pulls over. Two young women ask me if I am okay and if they can drive me anywhere. I tell them I am fine but I need a cell phone. I am thinking as I dial that some divorce attorney is going to make some big money this week if Mr. Dickinson doesn’t answer his phone. He does, and the SUV young women tell me that they are teachers in the Turner School District. Hug them both and wait for my husband and AAA. It is the small things. And maybe, just maybe our lives are knitted together by a whole bunch of small things that really matter. To those young women, it was the simple loan of a cell phone. To me, it was a big-time rescue. To those young women, zooming along at 65 mph, I could just as easily have been in their rear-view mirror. To those young women, I could have been just one more broken-down car on the side of the road. But those young women stopped their day for me. I easily had three decades on them. There is so much in our country that we can hang our heads about. So much ugliness, division, political posturing that is in no one’s best interests. We all watch the news. And then this. And for the price of a quick stop and a cell phone, it should make us all believe again.